Description: Acclaimed filmmaker Christopher Nolan directs an international cast in this sci-fi actioner that travels around the globe and into the world of dreams. 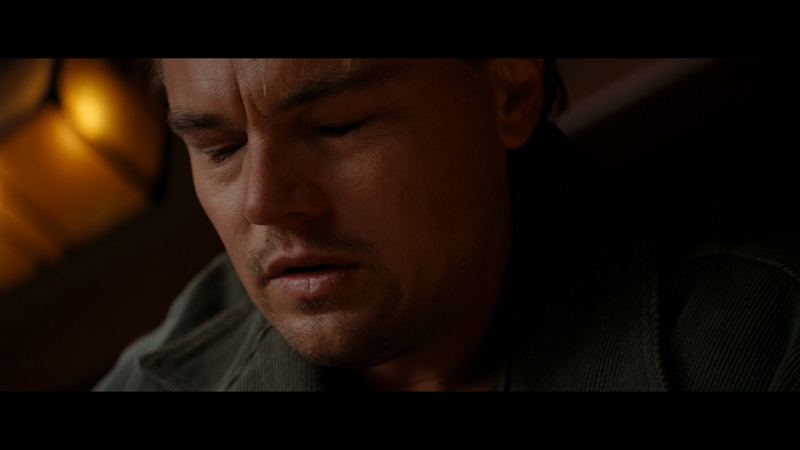 Dom Cobb (Leonardo DiCaprio) is the best there is at extraction: stealing valuable secrets inside the subconscious during the mind’s vulnerable dream state. His skill has made him a coveted player in industrial espionage but also has made him a fugitive and cost him dearly. 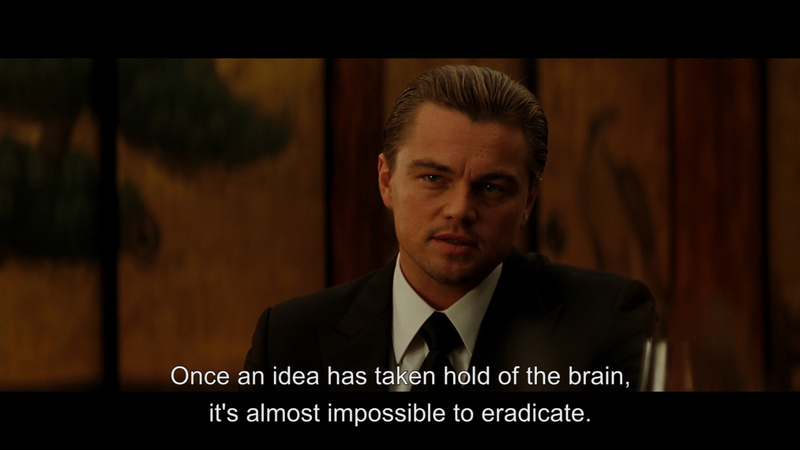 Now he may get a second chance if he can do the impossible: inception, planting an idea rather than stealing one. If they succeed, Cobb and his team could pull off the perfect crime. But no planning or expertise can prepare them for a dangerous enemy that seems to predict their every move. An enemy only Cobb could have seen coming. 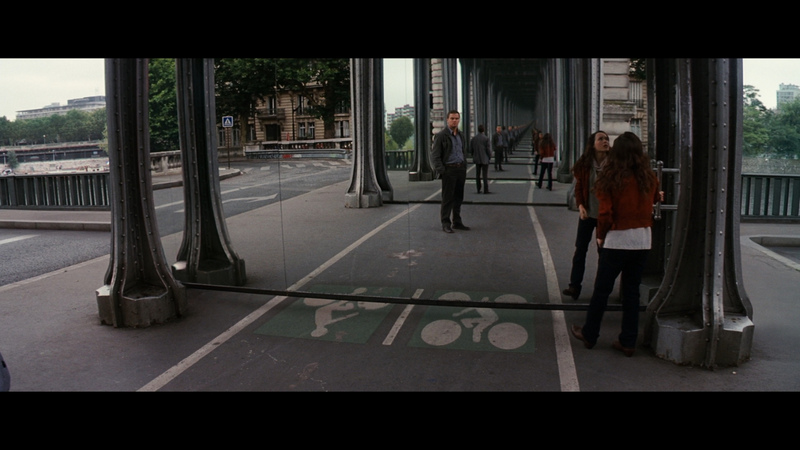 Inception looks damn impressive on Blu-ray from Warner. It's a VC-1 encode with a moderate bitrate but the first of 2 Blu-rays sharing it with only one supplement (the 45-minute 'Extraction Mode') - and the feature takes up almost 40 Gig. It is a 3 hour film but there are no untoward artifacts or undue noise to hinder viewing. Detail and colors - especially in the day lit scenes are highly impressive and the transfer handles the darker sequences very well also. 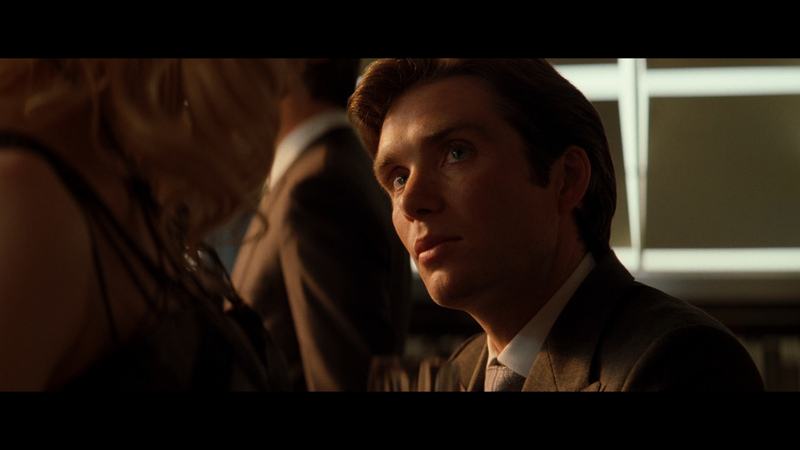 Actually the lighting can give a golden hue to some indoor sequences. Contrast is very strong and, coupled with the impressive effects, the dual-layered transfer offers a very desirable viewing - not quite 'demo' material (depending on the crowd or scene) but still a film that visually offers so much - perfect for Blu-ray consumption. 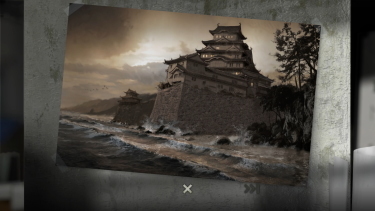 Actually, computer generated graphic are kept to a minimum in the dream sequences. 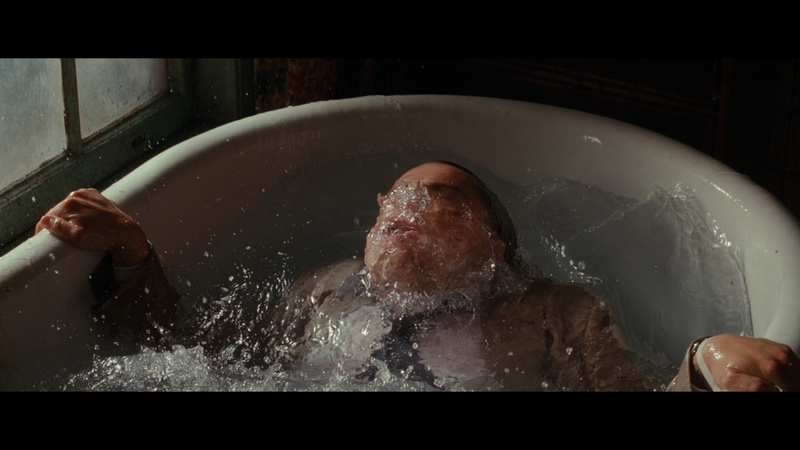 Inception had almost 500 visual effects shots but, comparatively Nolan's Batman Begins had over 600 - both are less than a lot of similar-genre modern films that can range in the 1000's. 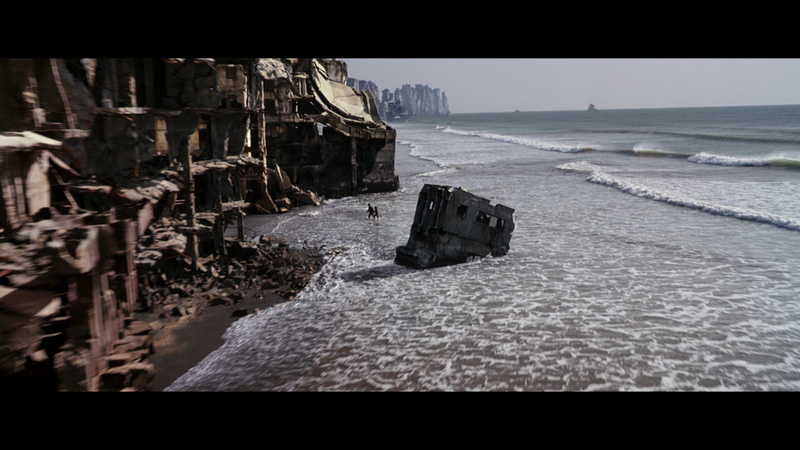 The glacial-like 'Limbo City' effects at the end of the film remain impressive eye-candy (that surely could be used as a single scene 'demonstration') and are visibly jaw-dropping in 1080P resolution. I am pretty close to calling this 'pristine' - it looks super. 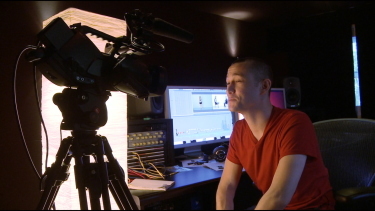 The audio track is likewise very impressive - we get a DTS-HD Master 5.1 at a robust 3678 kbps. 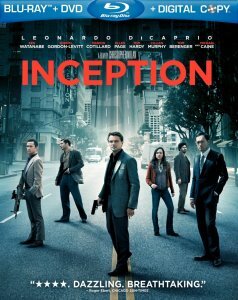 Inception is filled with effect sounds that are well separated and radiate throughout the room... with conviction. 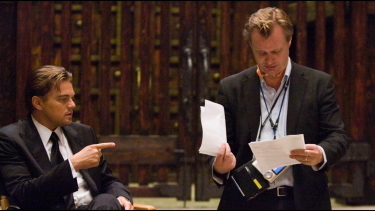 Hans Zimmer's score (the director's 3rd collaboration with the composer - having worked on Batman Begins and The Dark Knight) is self-described as "a very electronic score" and it can sound especially detailed in the higher end with crisp notes and a tight, controlled musical expression. 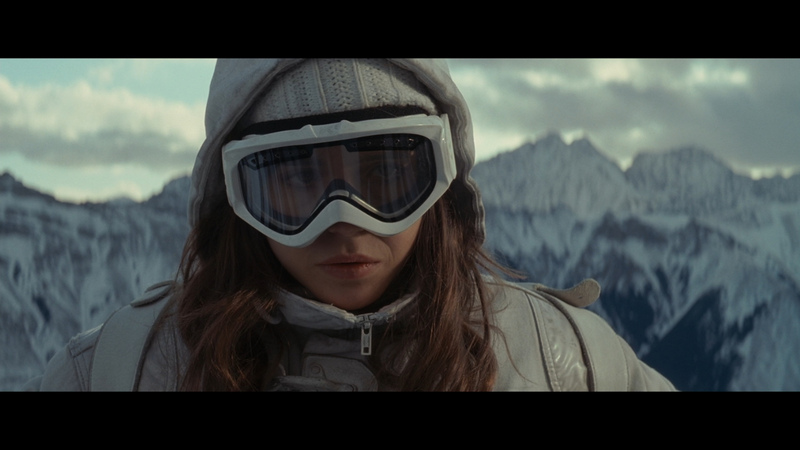 Zimmer intended some playfulness and it filters through often sounding less rigid and more bouncy. It is supported exceptionally well by the lossless track. There are optional subtitles and my Momitsu has identified it as being a region FREE disc playable on Blu-ray machines worldwide. 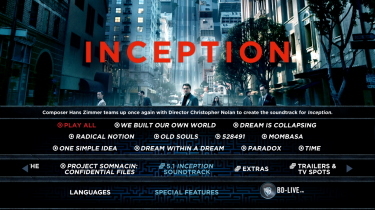 Extras venture quite deep - with, on Blu-ray disc one, an Extraction Mode: an 'In-movie' experience with 14 scenes, over 45-minutes, of bonus content featuring director Christopher Nolan and Leonardo DiCaprio giving input. This stretches from all sorts of dissemination of details from visual to verbal discussions. There is a lot here and those keen will have field day. 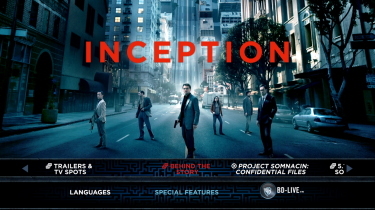 The disc 2 Blu-ray also offers its extras in English with optional French, Spanish, Portuguese subtitles. The 45-minute piece 'Dreams: Cinema of the Subconscious' is described as taking some of the most fascinating and cutting-edge dream research to-date on lucid dreaming, top scientists make the case that the dream world is not an altered state of consciousness, but a fully functional parallel reality. 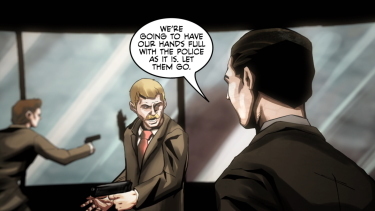 Inception: The Cobol Job is a very cool full animation and motion, comic prologue to see how characters Cobb, Arthur, and Nash came to be enlisted by Cobol Engineering and perform an extraction on Saito. It last 15-minutes but I could have watched it for an hour or two. We get the option of to listen to 10 isolated tracks from Zimmer's score - almost 40-minutes in total - sounding brilliant in HD, a conceptual art gallery, a promotional art archive, 3 Inception trailers (4:51 in total - in HD!) 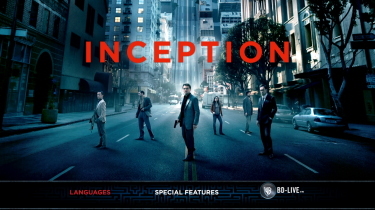 and 13 Inception TV spots (11:28 in HD!). The disc is also BD-Live functional with the untested Project Somnacin--Confidential Files: allowing access to the highly secure files that reveal the inception of the dream-share technology. Lastly, there is a DVD of the film - for those who wish to 'lend-out' or watch on their non-HD systems. Also the access code for a Digital Copy for your portable device. 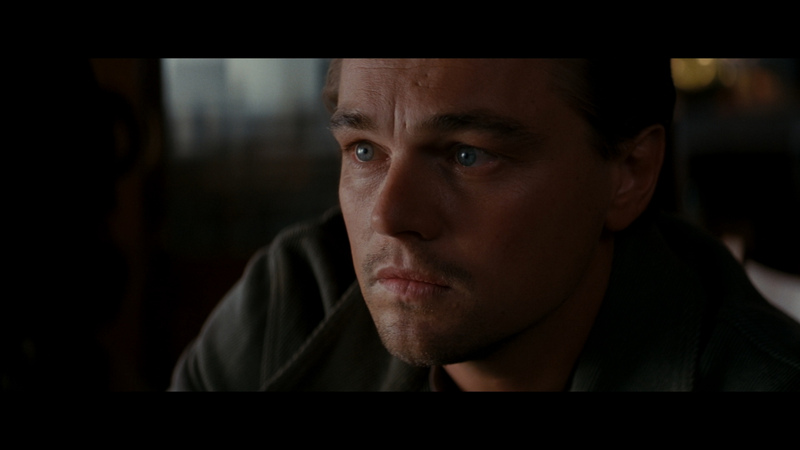 I don't think I'm alone when I say Inception is a hard film to get your head around in the first viewing. 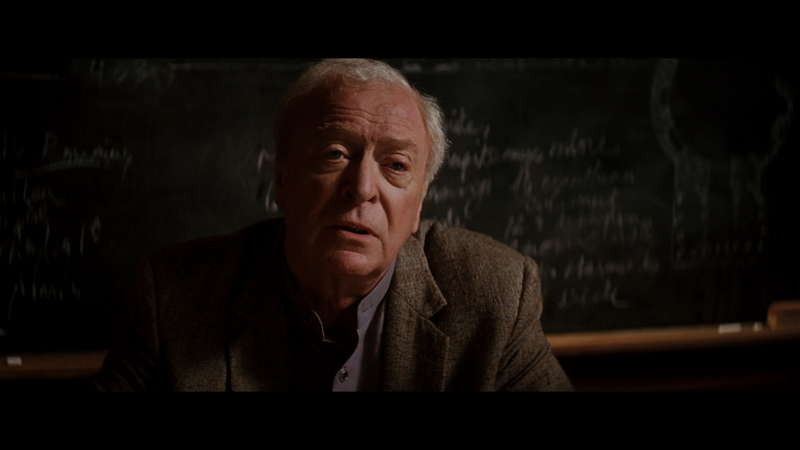 The Blu-ray represents both my second and third attempts - and I, only now, feel much more confident in my understanding. Of course the extras were prime in divulging some of the themes and intent. 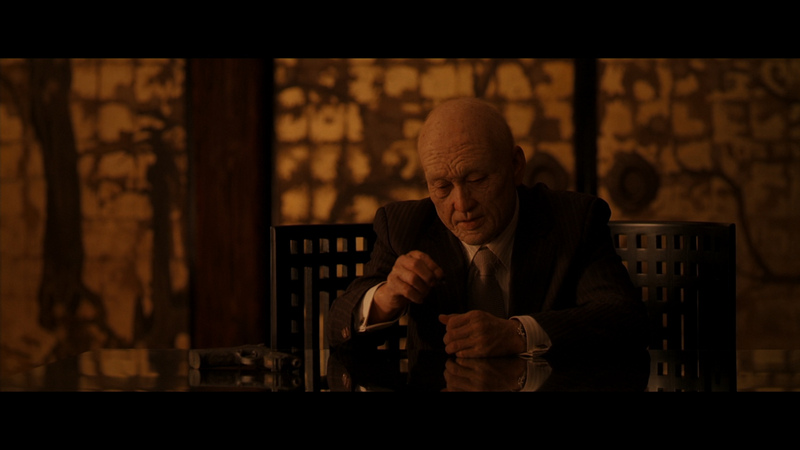 Inception is a film people will be able to discuss for years. The original idea of (an 80-page treatment about 'dream-stealers'), was written nine years before by Christopher Nolan and was intended as a horror - but upon re-visitation it worked more effectively as a science-fiction movie. With 'sharing subconscious ' there are obvious influences from films like The Matrix, Dark City, Josef Rusnak's The Thirteenth Floor and his own film Memento exported similar ideas as an excellent pre-cursor for the transformation of Inception to the big screen (very big - as in IMAX theatrical viewing). Beyond being very 'visual' it seems perfect for Blu-ray presentation. 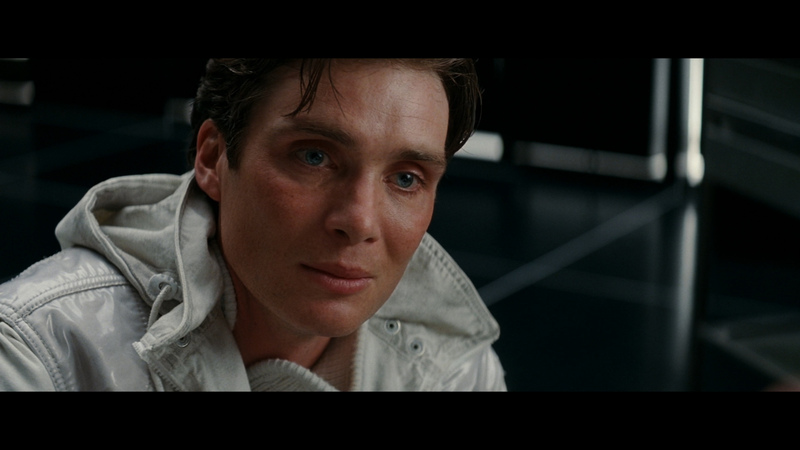 The entire 3+-hour film on one DVD would suffer from the SD format's limitations (checked the enclosed DVD - the bitrate is 4.4 Mbps - see sample above). 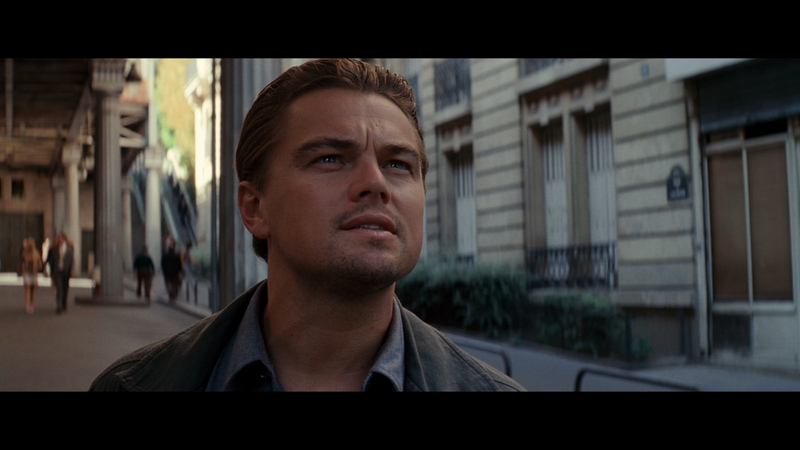 We won't be seeing Inception looking any better for home theater presentations and the versatile format can be used for to re-watch it multiple times - which may be very desirable. Warner knew this was a huge title for them and they have responded as you might expect - it is an exceptionally strong transfer (both audio and video) and is filled with intriguing extra features. This is a great package and one that will have longevity with fans... very strongly recommended!